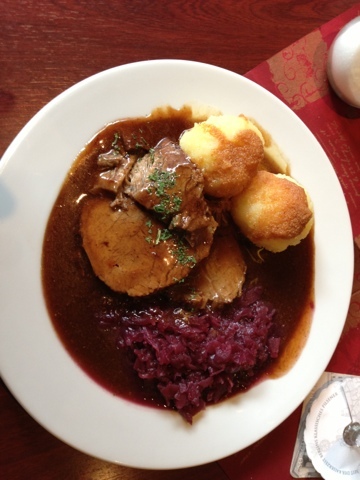 Food and photos for Francophiles: Berlin, en Allemagne! This week we'll be on "holiday" in Germany and we rather like it here. Our hotel has been nice, we've found a number of interesting things to do, and we've eaten some good food. One of my meals consisted of Sauerbraten, or pickled beef (pictured below), and tonight I had Wiener schnitzel. Wiener schnitzel is fried and muddled pork sausage. I had had it once before in Key Largo, and it was obviously much better here. The Schnitzel was served with jelly and lemon slices. It was served with a mixed salad of German slaw and lettuce. As far as things to do, Berlin has a ton. Today, we did a walking tour of the underground where Cold War bunkers were. We went to a stop on the underground line (the U-Bahn) known as Pankstraße (or Pankstrasse). The station would have been sealed in with big lead doors, and the walls were lined with lead. Having travelled through that particular station, I can honestly tell you that you would not know that it was a bunker. That's all for tonight. I'll talk to you later. Auf Wiedersehen!